In the tradition of John Berger's Ways of Seeing, Michael Rock, principal and founder of 2x4 Design in New York, explores the history and development of twenty-first-century visual and design culture. This book presents a thoughtful and witty exploration of graphic design today produced by Michael Rock of 2x4, the powerhouse creative firm that partners with some of the most design-savvy brands and institutions in the world to develop design systems that draw on both modernist traditions and the exuberance of contemporary life. 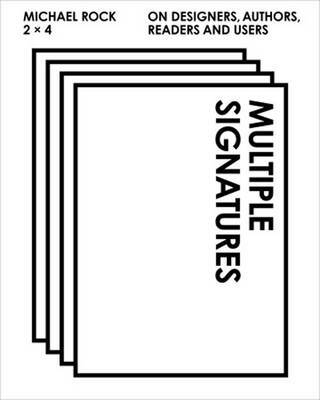 Set forth in an engaging and humorous way, Multiple Signatures examines all aspects of modern design, from typography to the evolution of screens in advertising to trusting one's own creative instincts, through a series of smart and often irreverent essays and images. Using 2x4's own collaborations and projects as examples, and drawing on the experience of the contributing authors, the result is not a clinical textbook, but a fantastic and thought-provoking work about the limitless applications of design. A must-have for design students and professionals, Multiple Signatures challenges standard ways of understanding design and inspires readers to think of graphic design as a building block for all creative disciplines.